PinkNoise Studio was founded in the November of 1996. 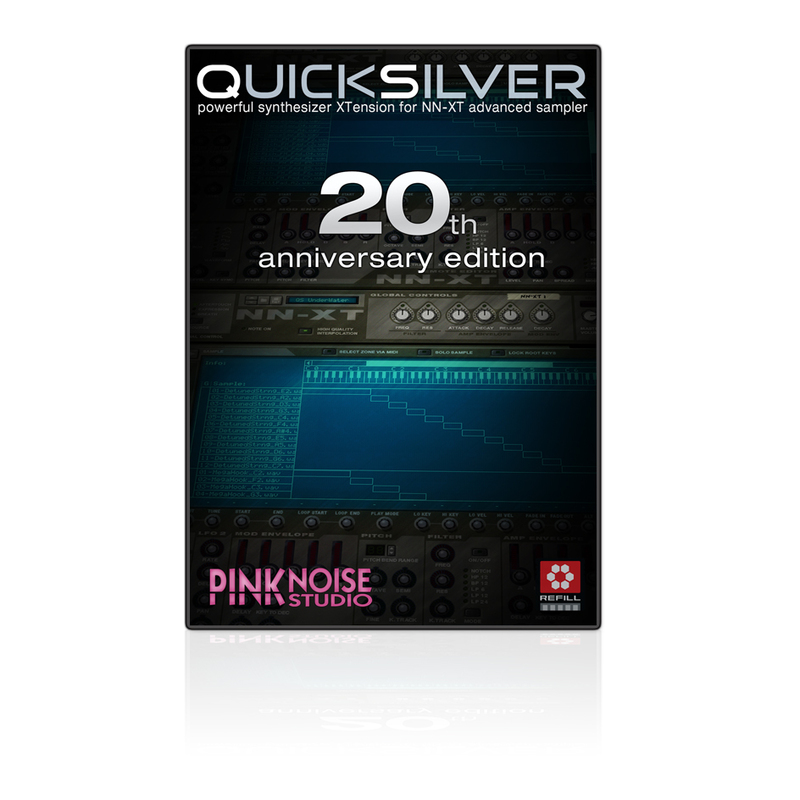 Now to celebrate our 20th anniversary, we are releasing QuickSilver as a gift to the Reason community. QUICKSILVER was our first refill that exploited the specific features of NN-XT sampler. We invented many tricks that were used for the very first time (for example the "release trigger" option which were implemented in props' Reason Electric Bass later), so we are sure it's worth to download, you will enjoy it! QS300 is a rich-sounding synthesizer, because it uses a multi-layer structure, every layer has its own envelope, filter, etc. We can create wonderful pads, endless morphing textures and some other warm and fat patches... but! If you record these sounds, you will loose the possibility of alteration later: you can not change the parameters of each layer independently, only for the whole mixed samples. It's just like a snapshot... sounds good but less versatile. Instead of this method, we have choosen a more complicated way. The QS300 uses small parts (in Yamaha terminology: elements) to build its sound: every layer is based on an element. We broke down the sounds of the QS300 to these elements, recorded all of them, and then we completely rebuilt the multilayered patches in NN-XT. You can find here the elements. We have also included these patches in the refill, we think they are useful for creating new NN-XT patches. 2 drumkits, 2 percussion kit and an SFX kit. All samples are perfectly looped and contain the unity note information for quick auto-mapping. Very complex instruments, smooth morphing sounds, textures for ambient music and filmscore. Wide range of bass sounds from analog sounding patches to acoustic-like basses. You can find some ethnic instruments and some elecric & acoustic guitars here. Special effects you have always been waiting for! :) Disgusting noises, messages from space, some tempo synced stuff. Use them for your next filmscore or to shock your neighbours. Lead synthesizer sounds that you can use as melody instruments in front of your mix. These are raw sounds using multiple simple waveforms, sounding fat but without a special character. A lot of very complex and rich-sounding synthesizer sounds for use in the background of your mix. The percussion sounds are not the leading force of the QS300... however they might be useful. A bunch of very colourful synthetic & acoustic-like keyboard patches. These instruments are for speeding up your arrangements with fast played melody lines. All samples were recorded and processed by PinkNoise Studio. QuickSilver is available for free: dclick here to login and download it!